Every once in a while, a restaurant salad catches me off guard and I set off to investigate how it’s made. I ask the server where the ingredients are from and what’s in the dressing and what makes it so…extra delicious? One such salad inspired this 30-minute recipe, and it lives at Solstice Pizza in Hood River, Oregon – a must-visit if you’re ever in the Portland area and craving some killer gluten-free, vegan pizza. The concept is easy, but it’s all in the texture and flavor combinations. The base is gorgeous mixed greens. The fruit is tender, ripe pear. Dried cherries add a slight chew and tartness. 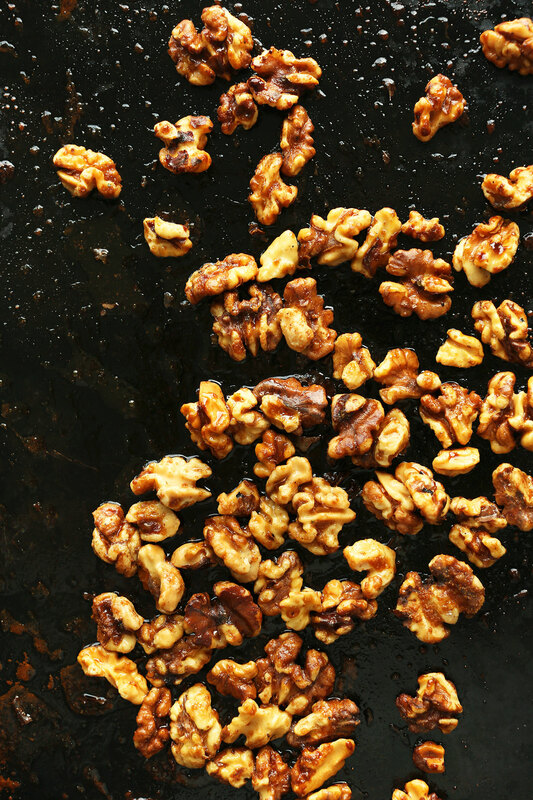 Super simple candied walnuts add crunch, nuttiness, and subtle sweetness. And it’s all tossed in a tangy, 4-ingredient balsamic vinaigrette. The result is a super fresh, semi-sweet salad with layers of flavor and texture. This is the perfect entrée when you want something healthy but filling! It would also make a delicious side to dishes like pizza, pasta, or veggie burgers this summer. 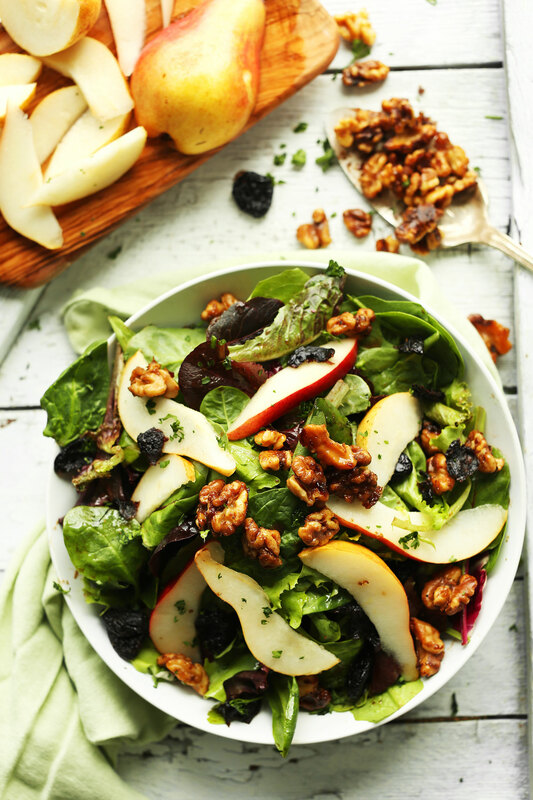 Incredibly flavorful, 30-minute pear balsamic salad with dried cherries and easy candied walnuts! A sweet and savory plant-based side or entrée. Preheat oven to 350 degrees F (176 C) and add raw walnuts to a bare or parchment-lined baking sheet. Once oven is preheated, toast walnuts for 7 minutes. Then remove from oven and add remaining ingredients directly to the walnuts (oil, coconut sugar, maple syrup, sea salt, cinnamon and cayenne - optional). Use a spatula to thoroughly toss/combine. In the meantime, prepare dressing by adding all ingredients to a jar (or mixing bowl) and shaking vigorously (or whisking) to combine. Taste and adjust flavor as needed, adding more balsamic for acidity, salt or pepper for flavor balance, or olive oil for creaminess. Set aside. Plate and garnish with remaining pears and walnuts, and serve with remaining dressing. Best when fresh, though leftovers store separately in the refrigerator up to 3 days. Store walnuts well sealed at room temperature. Can I give this SIX stars please?!? Truly excellent recipe! Very filling And great blend of flavors. 10/10 would eat it again! Even the picky hubs enjoyed it. Wow what a find! We recently moved from WA state…across from Hood River, OR the current location of the Solstice restaurant. We’ve loved everything at Solstice for years and this salad is one of our favorites! I was thrilled to find it when I was searching for a salad with pears…hoping that I could modify one to be as much as possible like the ones we loved at Solstice! 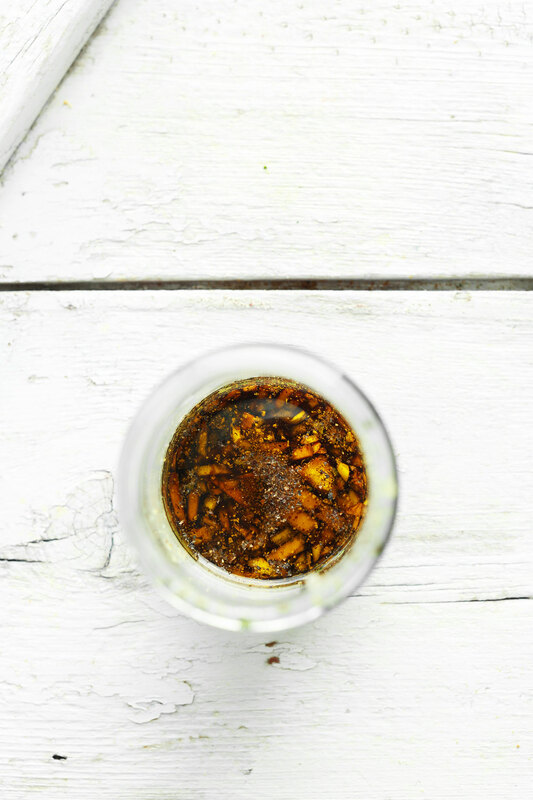 Imagine my surprise when I found the recipe on your site! Thank You! I love the flavor combinations of this recipe. Super tasty! I have a question. Although I love the candied walnuts, mine turned out very sticky. It uncomfortable having them get stuck to my teeth. Any suggestions? Did I bake them too long? Maybe they got too candied? I know this is an old thread but I had to tell you I served this as a side with biscuits and gravy and my husband thought he died and went to heaven…thank you. Hah! Glad to hear that your husband loved this, Rob! You could toss them in some lemon juice or there is a vitamin c based food preserver powder. You can find the powder in the grocery store but lemon juice works just as well. Common theme? Vitamin C/ Ascorbic Acid slows or prevents the browning. I recently took this salad to a BBQ……….high praise from everyone! Who would have thought that a salad could be the star of the table…..absolutely delicious ? Delighted to have this recipe as we were just there at Solstice Pizza in Hood River and had this salad. So memorable that we wanted to make it at home. And you provided us with the exact recipe! Thank you. i just came across this blog. 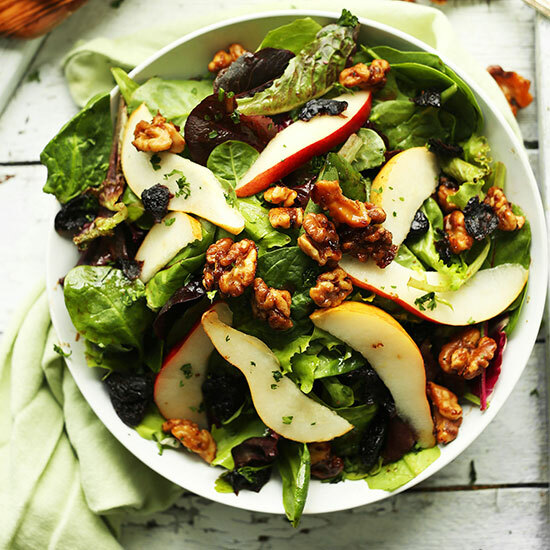 Before i came across this blog, my own version of making a similar salad (learned it from my sister) she used to add candied pecans and pears in mixed greens. They were equally delicious. Thank you so much for this blog and sharing. I just made this for a friend recovering from surgery. I couldn’t wait until tomorrow to test it. Totally addicted to the nuts! Thanks to my new friendship with Rowena Humphrey’s who follows you too, I”m trying lots of vegan recipes. I’ll love coconut sugar too. Thanks for all the time and dedication you put into all your recipes, Dana! I toasted the walnuts in my toaster oven at 350 but 7 minutes was too long prior to putting the glaze on them. A lot of them burned. One word:DELICIOUS!. Made it last night, it was delicious! My husband has been struggling with me learning how to cook plant-based and he said this meal was 10 times better than anything I had made before (this has been going on like 4 months….). I was a little offended considering this recipe is so easy but I was so glad he loved it! Allergic to walnuts… Would cashews or almonds work? Thanks for sharing this remarkable recipe with us. It looks sumptuous and fascinating. Definately, i will try this out with family on our next picnic to experience the good feeling of the yum together. Awesome post. Kudos!!! Thank you for sharing this recipe. I am going to add goat cheese as one poster suggested and will be a complete lunch for us. YUMMYYYYYYYY! This salad is light and refreshing. My husband loved it, especially with the surgared walnuts on it. It is sweet but oh so good. Thanks for sharing Dana!. I love this recipe. 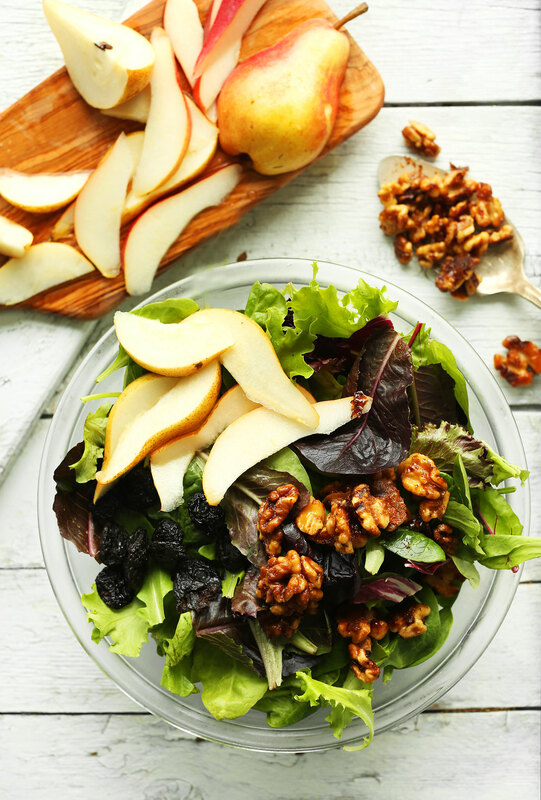 The combinations of the pear and salad sounds lip-smacking! I love the pics too! Fantastic!! Served this salad tonight for dinner and it was a big hit. I had to hide the candied walnuts while I prepared the salad as they were disappearing quickly! Definitely awesome! I always look forward to your wonderful recipes! Such a great surprise to open at work! I made this last night and it was just fantastic and delicious so many diverse flavors! Thanks for rocking it! Yay! Thanks for sharing and for the kind words, Noel! This salad looks wonderful! I love the pears and cherries together! This is a lot like a salad I love at Nordstrom’s. They add goat cheese…YUM! This sounds totally up my alley. I’m a massive pear + walnut fan :) pinning for future delicious meals! 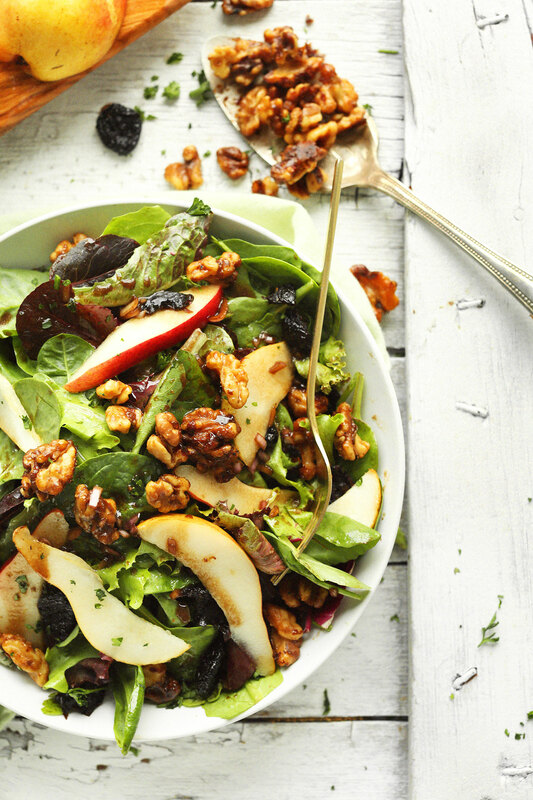 Candied walnuts are one of the best salad toppings. 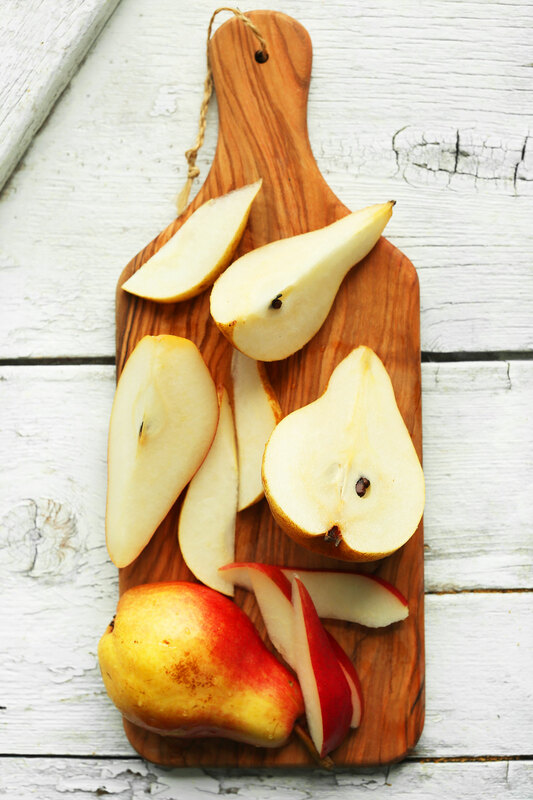 Combine them with fresh pear slices and dried cherries and you're on to something! Yum! This has a bit of a fall vibe to it but then the cherries totally mix things up! Love it. Looks amazing. The color of that pear is stunning! I adore candied walnuts on a salad, they’re the best!! Cherries are DEFINITELY the best. Wow, looks really interesting and yummy! I have never had pear in a salad before? !